The Rehydrant project was developed by a bunch of young engineers who had a simple but wonderful idea: make drinking fountains out of fire hydrants! So they created a small device which does just that, which is kind of a genius idea to make Budapest a little more comfortable and friendly during summer, when the heat strikes. Besides being a place to hydrate yourself and even refresh yourself with a splash of water, it’s an eco-friendly project – you don’t need to buy mineral water which means less plastic waste and it’s cheaper to construct than a regular drinking fountain. 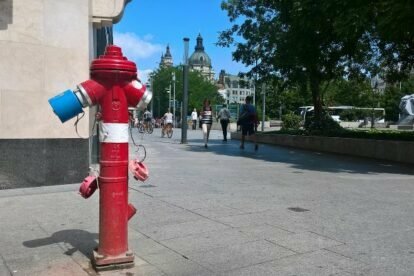 Moreover, the fire hydrants can still be used in case of a fire, so the Rehydrant project has only positive effects on the city’s life! On the creator’s homepage you can find a map of all the drinking fountains that have already been installed to quench your thirst – you can find them mostly at the city center, like at the beginning of Fashion Street near Deák Ferenc tér. And if you happen to like the idea as much as I do, you can purchase a Rehydrant for your own community, and spread the goodness throughout the world!